These two products, Fujifilm X-T10 and Sony a6000, are both mirrorless digital cameras that are available under a thousand bucks, making them viable choices for people seeking an affordable and budget-friendly mirrorless digital camera. 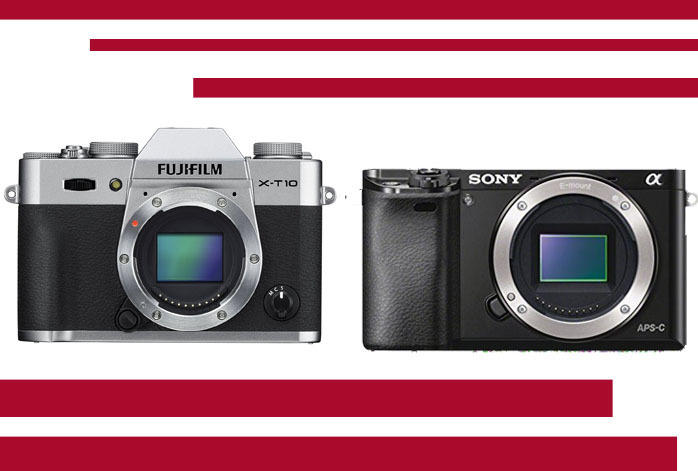 However, both Fujifilm X-T10 and Sony a6000 are extremely popular on the market, each having a considerable amount of positive reviews and responses from the respective users. Therefore, a lot of potential buyers get confused in choosing between these models. Thus, we have written this article to help you determine which model that you should choose. Available around five hundred bucks, yet it packs very attractive specifications and features. To begin with, it is armed with a 24MP APS-C CMOS sensor. It has 51,200 maximum ISO and 179 focus points. The images it captures are not only larger, but also sharper and more detailed. You will be able to pronounce more things with the abundant focus points. Sony a6000’s maximum shutter speed is ‘only’ 1/4000s, which may seem pretty common, yet it offers a continuous shooting speed of 11 fps! It can certainly handle fast-moving objects well. You would love Sony a6000 for its large buffer capacity – it can take 47 JPEG shots or 22 RAW shots before needing to pause. Additionally, besides the Wi-Fi connectivity it provides, it also supports NFC for quick and effortless data sharing with compatible devices. Though Fujifilm X-T10 has several unique things that make it a decent product, Sony a6000’s advantages of larger and sharper images, bigger buffer, also extended features make Sony a6000 the winner of the product comparison. Sony a6000 can give you more versatile and convenient usability.